Alright, so I’m a huge Coen brothers fan. I’ve seen nearly all of their movies and nearly loved every single one of them. I consider “The Big Lebowski” to be a masterpiece and is possibly my favorite film of all time. So I anticipated “Inside Llewyn Davis” highly. How does it measure up? This film is a bit of a mixed bag. 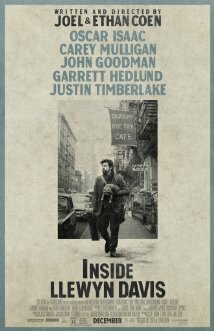 Following a folk singer struggling during the ’60s Greenwich Village scene, Llewyn Davis is down on his luck. Having no permanent residence and crashing on his friends’ couches every night, he struggles with his desire to make it big as a solo artist after his music partner dies. Featuring talented actors like John Goodman, Carey Mulligan, and even Justin Timberlake (who has pleasantly surprised me since he started acting), the film has a well-rounded cast that gives good performances. As with most Coen brothers movies, this film is all about the characters. This is good and bad. In the case of this movie, the story can get a bit thin, and we’re not sure what the message we’re supposed to have taken away is. Coen brothers films tend to be a bit nihilistic. Like “Burn After Reading,” we wonder if we’ve learned anything, and we really haven’t. Where that works in films like “The Big Lebowski,” I don’t feel like it worked that well here. “Inside Llewyn Davis” has some very good music, and the cinematography is very interesting to watch, even if it doesn’t work with every shot. We even get a “cameo” of Bob Dylan. It’s an interesting character study, although the story ultimately come out a little thin and we’re not sure what the point was. Not the Coen brothers best film, but decent and worth a watch. “Inside Llewyn Davis” earns 3.5 out of 5 stars. This entry was posted in Movie Reviews and tagged academy awards 2014, inside llewyn davis, movie review, oscars 2014. Bookmark the permalink.